Coffee is a reminder of the aroma of a wonderfully brewed drink that is so unique and now that has been given a new name with a herbal addition by a new Sri Lankan entrepreneur looking to attract a niche market for her beverage. The addition of cardamom, coriander and ginger to the coffee has been the blend of making Ceylon Herbal Coffee by Gayathri Yapa who has perfected the art of producing a drink that is said to have healing qualities with the ability to refresh the system. This product soothes the digestion and it refreshes you especially when you are tired and even eases during menstruation and a form of good recovery for hangovers, she said. The coffees are collected from small farmers and using a manual system the substance is hand processed with the roasting carried out on wood fire, it was noted. With the market inundated with a host of herbal teas, Ms. Yapa realised the potential for her favourite brew to make its mark as the coffee with herbal qualities and ingredients that would ensure a healthy lifestyle for consumers. The caffeinated drink, she noted does not give out the bitter taste but on the contrary it had a good effect on most local and foreign consumers so much so that the feedback has been overwhelming enough to consider selling stocks in the overseas market as well. 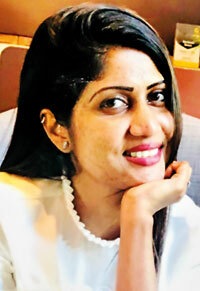 Recalling some of the key highlights of her sales, Ms. Yapa pointed out that while recently a blogger from Sweden had carried out a review of the product, another traveller had indicated to her that she would not leave Sri Lanka without taking a stock of the Ceylon Herbal Coffee back to her country. 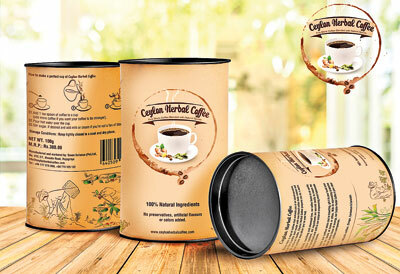 This coffee product is not supposed to become “just another coffee product” she observed adding that every Saturday she markets her product at the Good Market with some people offering to purchase her product after tasting its goodness. As a marketer for the past 14 years, Ms. Yapa has been involved in this field for a number of organisations but has now opted to concentrate on selling her product that she experimented with some time back. A taste that she has perfected after learning the art from her aunt who still brews this concoction, she noted that this would now be sold in Australia with 50 already packed off there with a number of openings also coming from markets like Dubai and Germany. Experimenting with foods even at home is a natural for her and right now she is engaged in doing the same in finding out how to detox the body. “Whenever I go out I love to drink herbal – I really love that herbal taste,” Ms. Yapa said. At the moment the product is sold at a price of Rs.380 that will change to Rs.430 for 100 g with supplies made to some of the boutique hotels in the south, with intention of expanding further to more boutique hotels. She pointed out that some of these hotels were providing this drink as something to be consumed by yoga enthusiasts following a yoga session. The drink has been produced after much experimentation and research on each and every ingredient in the product and personally “I have tried them individually and what sort of percentage there should be in it,” she said. In addition she has also consulted the services of an Ayurvedic physician in a bid to understand the importance of the ingredients and how their values can be ascertained to ensure they would be a nutritious and healthy beverage. Starting off last November the product hit the market and is now being featured in gift boxes and is considered to be the preferred brew to be served to Buddhist monks following an all-night pirith chanting service. This health drink is also said to be nice with a piece of kithul juggery or dates and some even drink it with milk, Ms. Yapa said.